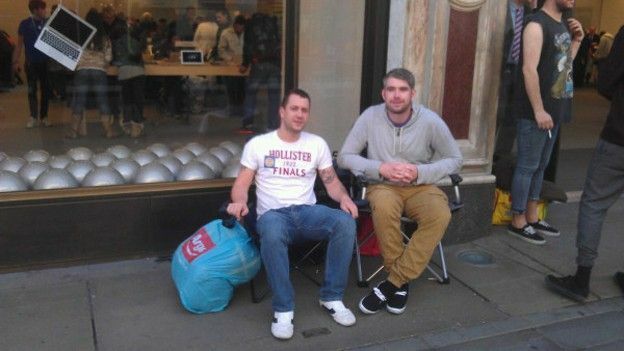 "We are going to be waiting for 160 hours in total"
Despite some disappointed grumbling over the iPhone-5-that-wasn't, the race to be first in the queue for the launch of Apple's iPhone 4S is already underway. Craig Fox, Apple fan extraordinaire and veteran of T3.com Apple launches, took up his place outside of the Apple Store on Regent Street yesterday evening. Craig has settled himself down outside the Store's doors with a week still to go before the launch of Apple's latest wunder-gadget, in order to promote his project JailbreakCon (previously MyGreatFest), with which he hopes to make jailbreaking Apple's iPhone a mainstream activity. T3's Luke Johnson caught up with Craig and his JailbreakCon partner in crime Daniel James to get their thoughts on the iPhone 4S. T3.com: Were you disappointed by the lack of an iPhone 5? Change in form factor? Craig: Honestly? Not at all. What were people expecting? its just a number, everything in the 4S is what would have been in the 5. T3.com: What do you make of Siri? Craig: I think Siri is great for businessmen, and for GPS in the car etc. I personally won't use it that much, but I think its the future. T3.com: How are you planning on passing the 160 hour wait? Craig: We have our MacBooks with us and I have my 3DS as well as a helicopter from iRemoco to play around with. T3.com: Is the 4S really worth the wait? Craig: For me any Apple product is worth the wait, and now with the loss of Steve Jobs I have to have the last device he worked on, on Twitter I have used the hashtag #iPhone4S(teve). Should you guys be getting in the queue? Find out in our exclusive look at the iPhone 4S and what lurks inside the box.